Did illness break out at your Mexican hotel? Did you eat incorrectly prepared food? Did you notice any symptoms connected to food poisoning while you were there? 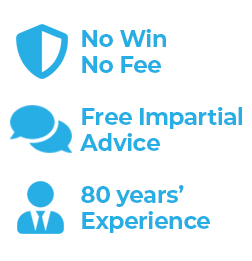 If your costs of legal action aren't insured, you'll be entitled to a no-win, no-fee agreement with Simpson Millar. Just contact our Mexico Holiday Illness Team and we'll get busy with your claim. Which Mexican destinations should I watch out for? What are my legal rights if I become ill in Mexico? Under the terms of the Package Travel Regulations 1992, the tour operator has responsibility towards your wellbeing if you've bought a package vacation. The firm must be able to assure you of hotel accommodation that's as hygienic as possible, with little threat of food poisoning or infection from waterborne parasites. So if you or one of your family suffers food poisoning or other illness at the hotel, the compensation you're entitled to is down to the tour company. And as long as your break in Mexico was sometime in the last 3 years (or with youngsters 3 years from when a teen turns 18) and your illness was the hotel's fault, you might find you've a strong case. The 16th century Spanish invasion of the Aztecs eventually gave rise in the 1950s to the expression 'Montezuma's Revenge' – an allusion to the Aztec Emperor Montezuma II and the many conquistadors who became unwell. Most illness stemmed from local food and water, much of which was infected by E. Coli. Today in Mexico the condition is in decline. However, few holiday seasons go by without outbreaks of illness, usually because of inadequate food hygiene. Hotel dining areas are often notorious for the wild birds flying through them, allowing the bacteria to be easily spread. The most frequent complaints received by our Mexico holiday illness team are Cryptosporidium, Salmonella, E. Coli, Campylobacter, Dysentery, and Shigella. Have you been affected by food poisoning whilst on your Mexican holiday? Get in touch for free guidance, or email us. Visit Holidaywatchdog, Tripadvisor and Holidaytruths to see if your hotel in Mexico has been affected, and find out the thoughts of fellow vacationers. Hotel-Watch will tell you the local hotels our specialists have been contacted about. If you're aware of one in Mexico struck by infections or illness, contact us. For more details, go to our weblog: Holiday-Hotel-Watch.com. Call Us on 0808 145 1353 alternatively contact us using the online form.